Mushroom soup – wholesome, creamy, healthy soup for toddlers and kids. Mushroom is a great immunity booster as its believed to kill viruses & bacteria’s and fight diseases. This mushroom soup is one of the nicest way to include mushrooms in Kids diet and best to give during cold/cough. 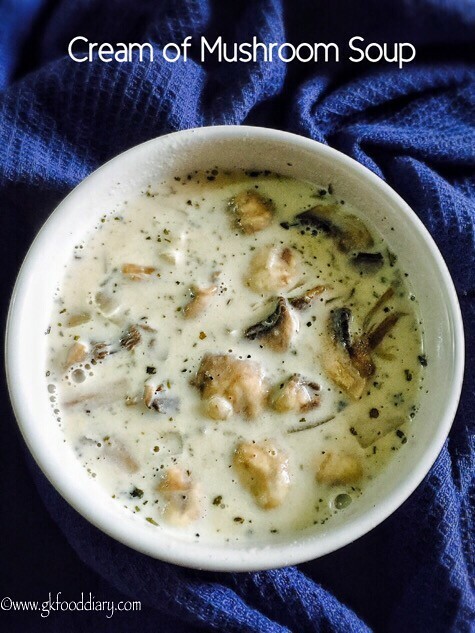 The climate here was so chill few days back & we felt like having soup and tried this creamy mushroom soup. It came out so well and tasted delicious. Little one at home enjoyed this soup very much:) This creamy mushroom soup can be given to toddlers from one year, after introducing mushrooms separate. Check out the other soup recipes I have posted so far. 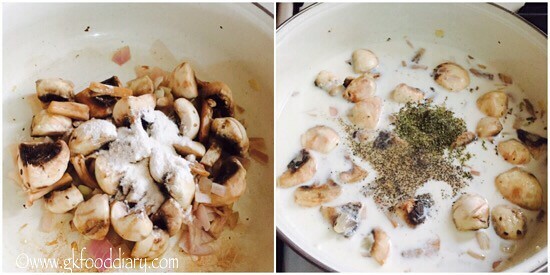 Now Let’s check how to make this easy cream of mushroom soup for toddlers and kids. 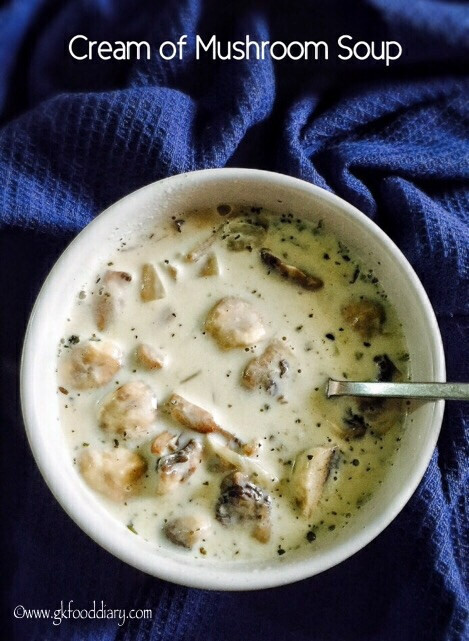 Mushroom Soup - Easy and creamy soup for toddlers and kids with mushrooms. Wash mushrooms in running water well. Remove the outer layer and stems. Keep it ready. 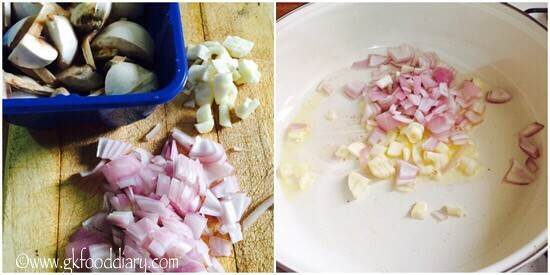 Finely chop onions & garlic. In a thick bottomed pan, heat a tsp of butter and add onions & garlic. Saute them for two minutes. Now add chopped mushroom pieces with wheat flour. Fry them until water leaves. This may take 3-4 minutes. Then add whole milk along with pepper powder & salt. Boil it in a medium flame until slightly thick. Lastly add fresh cream/grated cheese. Mix well. Boil it for two more minutes and Switch off the flame. 1. Wash mushrooms in running water well. Remove the outer layer and stems. Keep it ready. Finely chop onions & garlic. In a thick bottomed pan, heat a tsp of butter and add onions & garlic. Saute them for two minutes. 2. Now add chopped mushroom pieces with wheat flour. Fry them until water leaves. This may take 3-4 minutes. Then add whole milk along with pepper powder & salt. Boil it in a medium flame until slightly thick. 3. Lastly add fresh cream/grated cheese. Mix well. Boil it for two more minutes and Switch off the flame. 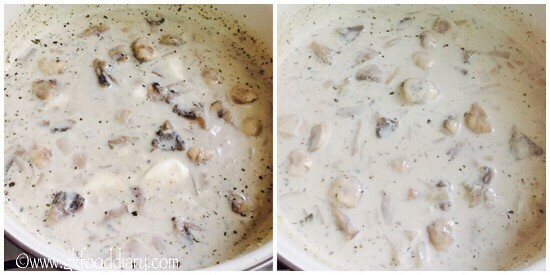 Healthy creamy mushroom soup is ready to feed your kid. Serve warm! Introduce this mushroom soup to your baby, after introducing mushrooms separate. 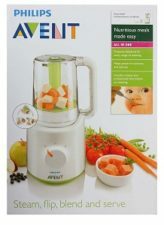 You can grind the mushrooms after sauteing and boil with milk, if your baby don’t like to eat mushrooms as such. Adjust spices according to your preference. 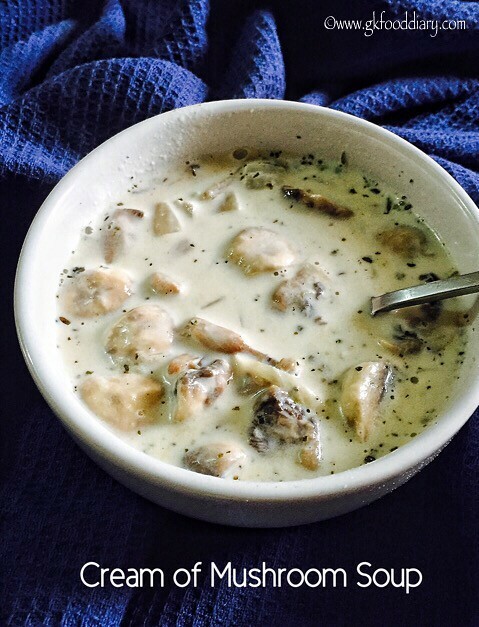 You could add a pinch of mixed Italian herbs to this mushroom soup for older kids and adults. Hi. i want to know what cheese and cream you used. Preferably how did u source it. it is fresh cream and cheddar cheese.